REACH: ECM is fully aware of the European REACH Regulation EC No 1907/2006 and has dedicated programs and resources to deal with legislative requirements and business continuity concerns related to REACH. We are regularly monitoring the continuing additions of Substances of Very High Concern (SVHC) to the Candidate List, which is the first step of the REACH Authorization procedure. Please visit the ECHA website for the most up to date official version of the Candidate list: https://echa.europa.eu/candidate-list-table. Be assured that if any SVHC is identified in any of our products above the threshold of 0.1% by weight we will communicate the required information to our customers (in accordance with REACH Article 59(10)). RoHS: Directive 2011/65/EU (RoHS2) entered into force on 21 July 2011 and became effective on January 3, 2013 repealing Directive 2002/95/EC (RoHS). The expanded scope of RoHS 2 phases in the previously excluded categories of medical devices and monitoring & control instruments, as well as certain cables. Additionally RoHS2 requires, for finished EEE1, the use of the CE mark to demonstrate compliance with the Directive. Link to the FAQ guidance: http://ec.europa.eu/environment/waste/rohs_eee/events_rohs3_en.htm. Initially RoHS2 set off with the same hazardous substances and the same maximum concentration limits as RoHS. Therefore, all products meeting the substance restrictions of RoHS remained compliant to the substance restrictions of RoHS2. On June 24, 2015, the new Delegated Directive 2015/863 entered into force, adding 4 new substance restrictions to Annex II of RoHS2. Those substance restrictions will come into effect as off July 22, 2019. ECM has strived to eliminate these banned substances from our products. If you need certification that a product is RoHS compliant, we can provide you with any certification you may need. updated at least once a year, has grown to include more than 900 chemicals since it was first published in 1987. Infrequently handled cords are exempt, based on the Proposition 65 wire and cable settlement taking the form of a Consent Judgment submitted to the court in San Francisco. It was agreed that Cords and Covered Products, which because of their size, weight or function, are infrequently handled (such as upon their installation in a setting where they are not typically plugged and unplugged). A list of over 200 of these types of infrequently handled products was created in Exhibit F of the Settlement Agreement. Some examples of infrequently handled cords: building wire, printer cables, riser/plenum cable, speaker wire, telecom data cable, telecom power cable, telephone power and data cords, thermostat cable, utility cable, signal cable, power control/ instrumentation/ cable, utility wire and cable, etc. Also exempt: cords that are internal components not normally accessible to consumer during ordinary use. 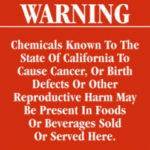 Electri-Cord Manufacturing products may contain chemicals known to the State of California to cause cancer and birth defects or other reproductive harm. However, as they do meet exempt criteria, are therefore deemed exempt from the above mentioned referendum. Businesses are also exempt from the warning requirement and discharge prohibition if the exposures they cause are so low as to create no significant risk of cancer or birth defects or other reproductive harm.